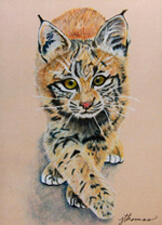 Jan explains why she spends so much time with pencil and brush: “I’m inspired by the wonders all around us, from cactus wrens to bobcats! “Taking photos and drawing seem like a natural response to the beauty of the Sonoran Desert, and I feel a kindred spirit with the bird or animal I paint.” The pictures on her note cards are smaller versions of her larger, original pieces that are suitable for hanging on the wall. These cards are a great way to send greetings from Arizona! 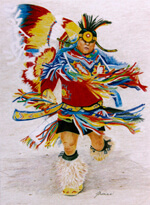 Jan strives for photo-realism in her pieces, whether she’s working in colored pencil or watercolor.